Greenstone Farm is set on 40 hectares in the heart of the Howqua Valley. The generous, architect-designed house is built from local stone and sits overlooking the beautiful Howqua River. Its grand proportions comfortably accommodate up to 12 guests and is perfect for couples or family groups. The house, accessed via a private bridge, is designed on a grand scale; words do it no justice. The luxurious living areas include a magnificent open fireplace and sunken lounge, dining area for 12, a fully equipped Tasmanian oak kitchen and soaring cathedral ceilings. The four bedrooms are all equipped with ceiling fans and both upstairs and downstairs, with reverse cycle air-conditioning. The house boasts a sumptuous indoor heated spa and superb undercover, outdoor, entertaining area, including open fire, massive barbecue and dining for 12. All linen and bath towels are included for your stay. From its vantage point, the house enjoys unparalleled views over rolling pastures, through wooded valleys to stunning mountain peaks. From the upstairs balcony, the outdoor terrace – and from every room, the scenery is breathtaking. Take full advantage of all the property has to offer. 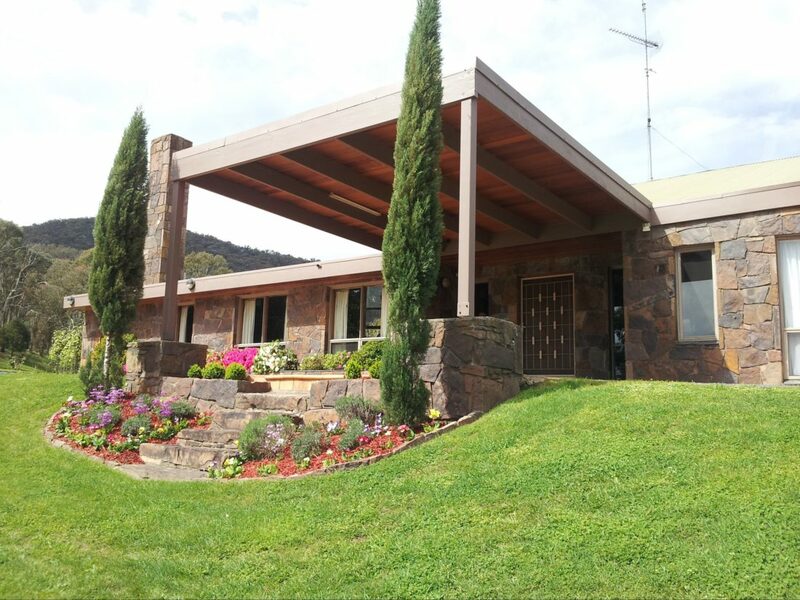 Bring your family/friends to enjoy an unforgettable retreat in the Victorian High Country. Greenstone Farm has four bedrooms, main bedroom has a queen size bed, full ensuite bathroom and balcony. Two bedrooms downstairs each has a queen size bed, a king single bed plus single trundle. There is also another small bedroom upstairs with two single beds for adults or children. Downstairs there is a lounge room which features a sunken television viewing area in front of an open fire with guard, a dining area with seating for twelve, The Tasmanian Ash kitchen has a walk in pantry, double oven, microwave and all the appliances and crockery needed for up to twelve guests. There is also a new downstairs bathroom, extra powder room adjacent to laundry and separate spa room which leads out to the undercover outdoor area.